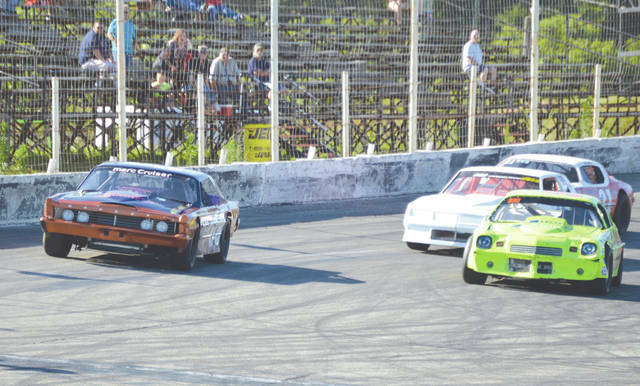 The Sunday Slam’s closest finish came in a four-lap dash between the four fastest qualifiers in the Sports Stock racing division, July 8 at Kil-Kare Raceway. DeGraff’s Buck Purtee (far left) edged Trotwood’s Josh Longstreth (right) just before the finish line to claim the win. A DriftIndy race official shot video while two cars performed donuts around him in the Kil-Kare Raceway infield — and lived to tell about it — July 8 during Sunday Slam. The DriftIndy drivers graciously filled in the “dead time” between stock car races, by demonstrating their drifting techniques to the appreciative crowd. Columbus’s Tyler Knuckles claimed the 30-lap Modified class feature race by 3 seconds over Jamie Sites of Tipp City, July 8 during the Sunday Slam at Kil-Kare Raceway. Columbus driver Matt Haygood, his family and crew celebrated Haygood’s first-ever A-Main feature win, after claiming the top spot in the 20-lap Compacts division race, July 8 at Kil-Kare Raceway’s Sunday Slam event. 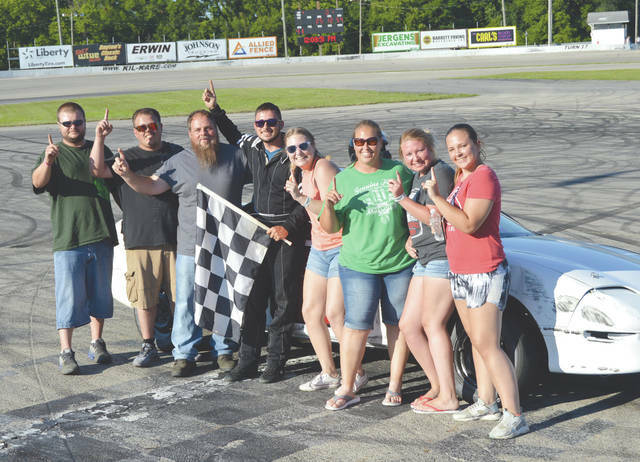 Jamie Sites waves the checkered flag, as his family and crew celebrate his win in the 25-lap Sport Stock feature, July 8 at the Sunday Slam stock car racing event at Kil-Kare Raceway. Sites was also runner up in Sunday afternoon’s Modifed race. XENIA — Billed as the Sunday Slam, a three-event racing card featuring two classes that no longer race on a regular basis on the 3/8-mile paved oval, Kil-Kare Raceway treated race fans to a rare Sunday afternoon stock car and open-wheel racing event. The fenderless, open-wheel Modified racing class was on hand. 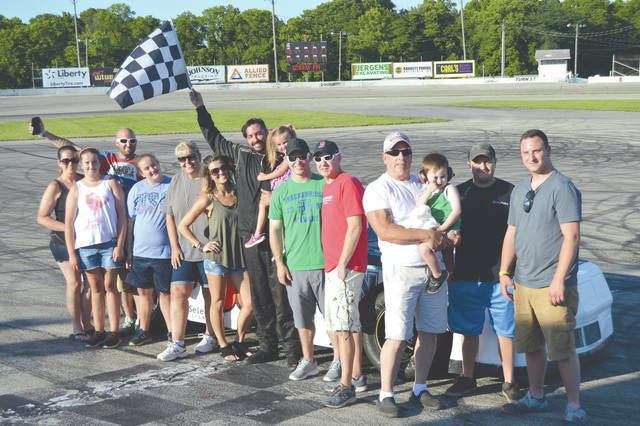 Those drivers usually pair up with the Late Model drivers for a two-race night of fun on Friday nights at Kil-Kare, but for this particular Sunday they were joined by the Sport Stock and Compact racing classes. Older Chevy Camaros, Novas and Chevelles, even a Mercury Cruiser, were among the Sports Stock field. Tipp City’s Jamie Sites won the 25-lap feature by 2.3 seconds over Obetz’s Ralph Vinson. Sites had a pretty good day. Earlier during the Sunday Slam, Sites piloted his Green Arliss Williams-owned Modified racer to a runner-up finish in that 30-lap feature. 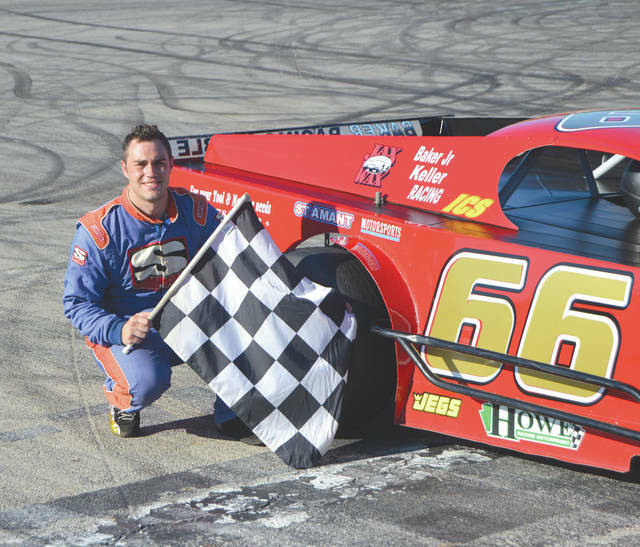 Tyler Knuckles of Columbus and assumed to be related to the Knuckles family of Columbus Motor Speedway fame, won the Modified feature. The Compact division was a sea of Pontiac Sunfires, some Chevy Cavaliers, and even an Acura Integra. Twenty-year-old Matthew Haygood of Columbus celebrated his birthday almost 10 days early by claiming his first-ever main feature win. Despite banging off the frontstretch wall, after going a little bit too wide to pass a slower car two laps from the finish, Haygood crossed the finish line 2.3 seconds ahead of Spring Valley’s Ryan Barrett. Most of the tower race officials were either former employees at Columbus Motor Speedway, or they had come over from Shady Bowl Speedway in nearby DeGraff, to help run Sunday’s event. Several staffers expressed hope that Shady Bowl and Kil-Kare could arrange their schedules for the 2019 racing season to where the two tracks could form a racing series together. The new management at Kil-Kare Speedway did not respond for comment before presstime.